The Emer Casey Fun Run in Melbourne has been a superb ambassador for the Emer Casey Foundation in Australia for the past 11 years. The Run has raised an incredible AUS$330,000 for ovarian cancer research at the Peter MacCallum Cancer Centre in Melbourne. The hard-working committee has decided that the Fun Run will not take place this year and that other more sustainable fundraising efforts will be explored. We at the Foundation know the time and effort it takes to organise an annual event like the Fun Run and couldn’t be more grateful to the Melbourne Committee for its efforts to date. More information on fundraising in Melbourne going forward can be found on the Fun Run website here. For World Ovarian Cancer Day on 8th May, the Melbourne Committe will be doing a tour of the Peter MacCallum Cancer Centre and receiving an update on research progress. There will also be a Morning Tea event on 11th May so keep in touch with the Fun Run website for further details. A heartfelt thank you to the Melbourne Committee and their supporters, including our wonderful patron Sonia O’Sullivan. To all Fun Run participants, volunteers and sponsors – we are so grateful. 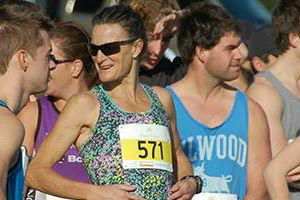 The Fun Run is leaving a wonderful legacy in the work of the Peter MacCallum Cancer Centre – be proud!! 10th Annual London Run a great Success! Lymphoedema – when your contributions really make a difference! The Emer Casey Foundation was set up in 2006 following the death, at a young age, of Emer Casey from Youghal Co. Cork from ovarian cancer. You can read more about the background and inspiration for our work here. © 2019 Emer Casey Foundation. All Rights Reserved.